Arthur Booth, 49, was in Miami-Dade Circuit Court for a bond hearing Thursday when the judge recognized him as a former middle school classmate, triggering a tearful outburst from the defendant, according to the Huffington Post. 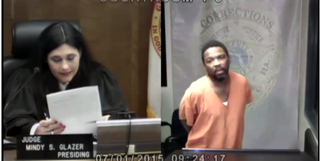 Booth, a burglary suspect, appeared before Florida judge Mindy Glazer, who at the end of the proceedings asked him whether he had attended a nearby middle school, the Post writes, citing a report at WSVN News. Booth was arrested Wednesday in connection with a June 29 burglary. “Oh my goodness, oh my goodness,” Booth said, bursting into tears as the judge reminisced about their childhood, the report says. Booth’s cousin Melissa Miller told WPLG-TV that she believes Booth cried because he was ashamed, the Post notes. Glazer, who set bond at $43,000, said she hopes Booth will turn his life around, the report says.